Entering the charming entrance of the cottage, I was greeted by a familiar, friendly face and warmth that is second nature to Caribbean natives. My early arrival briefly interrupted her picking callaloo from the gardens but she ushered me into her private deck where the magic happens. Meet Lorraine Kenlock. She’s the quintessential business woman running several successful ventures simultaneously including wedding styling, villa management and private chef services at luxurious villas in the Turks and Caicos Islands. In any conversation about private dining in Turks and Caicos, Lorraine’s name is bound to come up. Originally from Jamaica, Lorraine relocated to the Turks and Caicos Islands in 2003 and fell in love with the islands. 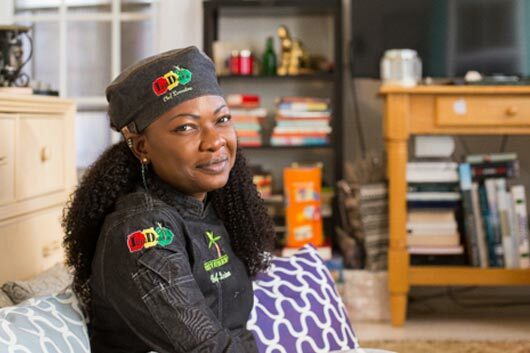 In 2011 she took a leap of faith and founded Irie Dawta Private Chef Services. After over 10 years in the health care field, Lorraine now uses her advanced knowledge to not only use food as a source of nourishment but for holistic healing. Her newest venture, Frenz Deck offers patrons a unique and intimate dining experience using a farm to table concept. 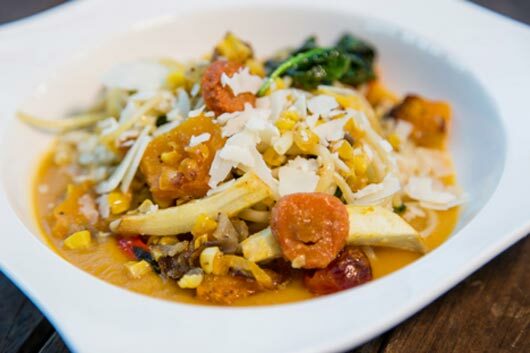 Upserve defines the farm to table movement as ‘food made from locally-sourced ingredients, often natural or organic’. 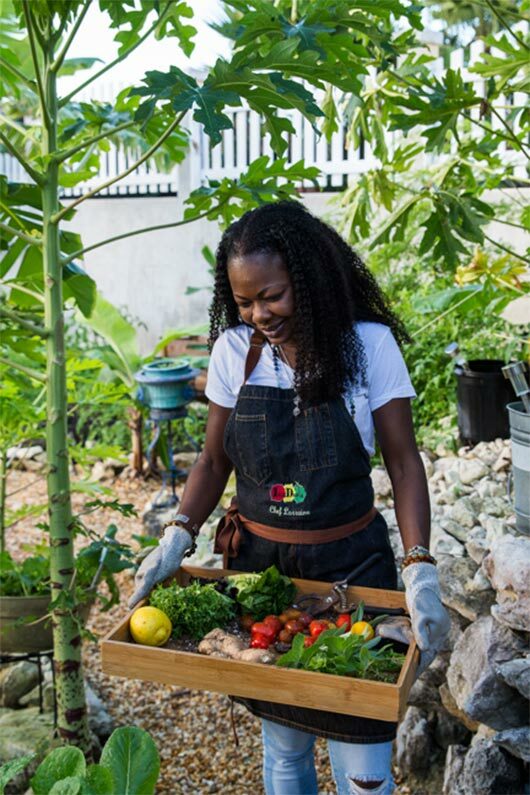 The farm to table movement in general is not novel to the Turks and Caicos Islands. In fact, it was once the primary way of life. Growing up in the community of The Bight, my grandmother kept a garden of sweet potatoes, guava, okra and peas. As children we were always excited to help her pick the fresh produce to be used in the evening’s meal. 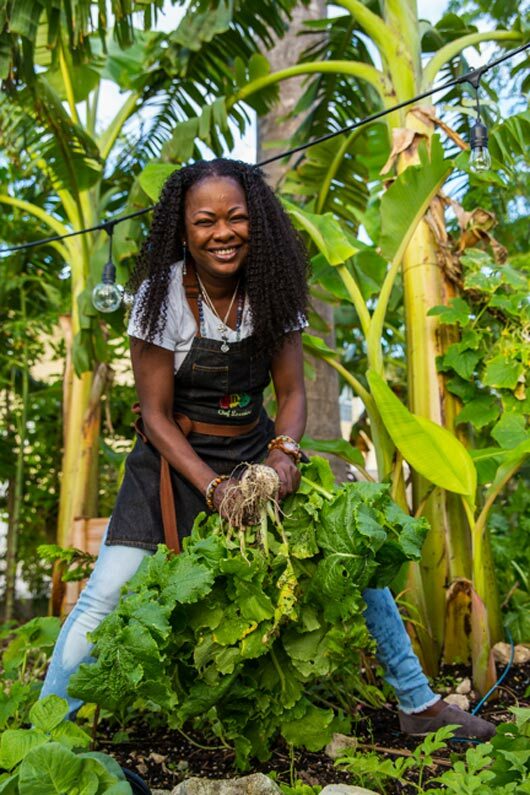 Many others throughout the Turks and Caicos Islands have similar tales of family farming before the influx of processed and canned goods into the islands. Further, in islands like South Caicos, our fishing capital, the sea to table concept was the order of the day. Today, there’s a resurgence in agriculture as local farmers are selling their produce directly to consumers at weekly farmers market and also to grocery stores. Finally, we’re going back to our roots! Amid the zen-like atmosphere of Frenz Deck, Lorraine picked fresh ingredients from her garden that’s steps away and prepared to serve an exquisite meal with her usual signature flair. She guided me through the garden, carefully pointing out each type of produce and with pride recited its health benefits. She explained that she learned to garden as a child and that her upbringing was one centered on healthy lifestyle and flavorful cuisine. I took a seat in a swing chair to ask her pertinent questions about her passion for curating memorable dining experiences and the introduction of the farm to table restaurant model to the Turks and Caicos dining scene. Elisha Jennings: What do you bring to the Turks and Caicos dining scene that is different from the others? Lorraine Kenlock: I don’t see food as just food, I create a complete dining experience from the scents to the look and the atmosphere. Once someone steps into a space that I’ve created, whether it’s at their home or a private villa or even at the Frenz Deck, the atmosphere is set. Guests immediately feel relief and can get ready for the meal. I believe that healthy food doesn’t have to taste like cardboard. It can be delicious, nutritious and beautiful. I also bring a unique perspective because I went into food out of curiosity of how food affects the body and the health and wellness of a person; not just physically but also emotionally and mentally. EJ: What do you enjoy most about working as a chef? LK: Meeting people. I meet the most amazing people and I get to explore personalities. I get to match the food to the personalities. You’d be surprised how much a person influences how I cook and what I prepare and how the meal turns out. When I step into a kitchen it’s like something takes over. I never cook the same thing twice. I also don’t follow recipes, the ingredients are there and I just flow. I love that I don’t have to overthink the process and there’s no hesitation. This is a natural gift and the more I’ve learned to appreciate this the more I’ve enjoyed what I do. 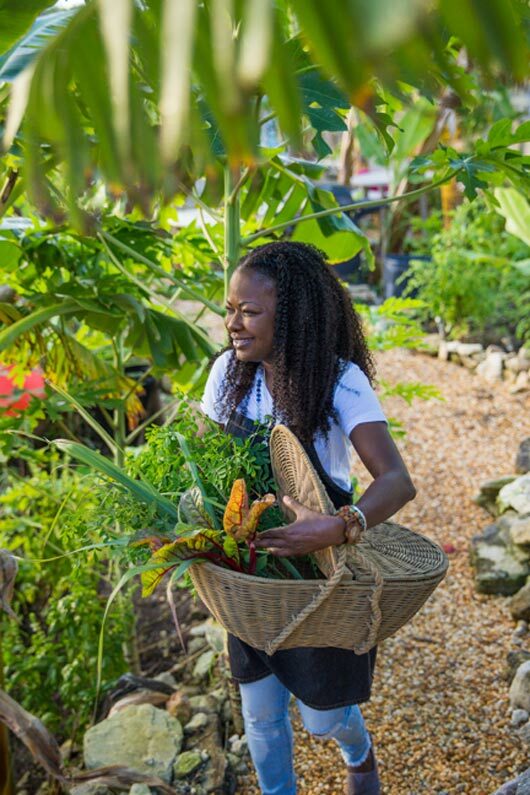 EJ: What inspired you to introduce the Farm to Table experience to Providenciales? LK: The need to bring forth good food to people and the fact that Turks and Caicos has a reputation that everything is imported and we have no farms. I wanted to change that. I’m from Jamaica and we grow crops in our yards or we go to the market and purchase directly from farmers. I don’t believe or subscribe to the thought that nothing grows in Turks and Caicos and specifically Providenciales. My garden started out as an experiment while I was being certified as a clinical herbalist. The practical aspect of my certification required me to have a garden. Then, my garden grew and I decided to start growing things to use like herbs, scallions, vegetables, etc. The Frenz Deck dining experience had been in existence for 4 years, but then I thought why not use what I have in the garden when preparing meals at the Frenz Deck and base the theme on what’s growing in the garden. From there, it slowly evolved and I’m glad it did. EJ: Tell me more about the process from plant to plate. LK: There is no process really. Once I receive a booking, to be very honest, I don’t start thinking of the menu until the day of the dinner. I go to the garden and see what’s there and I review the food profile of the guest. When making a booking a food profile is completed by the guest for health reasons (allergies and dietary restrictions). That information is all I use to craft the menu. Once I’ve seen what’s available or blooming in the garden on that afternoon then I start thinking about menus. From there the menu grows and sometimes even while the guests are having appetizers and I’m in the kitchen, the menu is still evolving. My sisters get a thrill of it because they know that during dinner, even in the middle of the first course the third course could be changed. 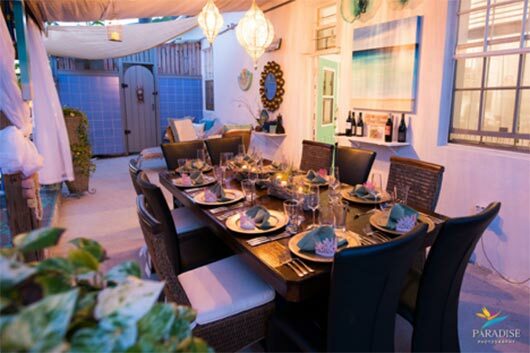 Our Frenz Deck dinners are typically six or seven courses. By course three, the fourth course could change altogether based on the vibe that I’m getting from the guests at the table and the mood. It’s not bottled, I go with the flow and it’s a natural process. EJ: Where does your inspiration for recipes and culinary combinations come from? LK: It comes from my garden. I do have chefs that I admire that are not necessarily popular but they think outside of the box, like Francis Mallmann. I love Francis Mallmann and his creativity and boldness. If I had to think of one chef that I admired most and who I look to for inspiration, not just food-wise but how he thinks and how things flows with him, Francis Mallmann is one such chef. There are others, but he’s the main one. My inspiration also comes from my environment and what I see around me. I might see an ingredient and think ‘I wonder what it would taste like if I added the flavor of coffee?’. Even though I try to never repeat a dish, one of my popular appetizers is my spiced tomatoes. This is because guests always tell others and most of my bookings are from word of mouth referrals. For that particular dish the tomatoes, which are grown in my garden, are roasted and I decided to add the flavors of coffee and cumin and it just came together. People love it because there’s a mustiness and sweetness plus I add honey, goat cheese and other flavors that go into that one bite. I have been told by someone that it’s the most perfect appetizer that they’ve ever had. I marvel at that because as much as people love it, I don’t think I’ve ever tasted it. So, that’s how my brain works. I get inspiration from all over and I run with it. EJ: What can guests expect when booking a reservation for Frenz Deck? LK: They can expect an adventure. I always tell people that trust is a two way street so I’m expecting them to trust me. If there’s no trust and they need to see a menu to feel comfortable, the Frenz Deck is perhaps not the place for them. If they come in with a sense of adventure and knowing that their well-being is going to be taken care of, then they won’t have any worries. Frenz Deck is for the adventurous, open-minded person who wants an experience that’s not bottled. Every experience on the deck is different. Guests will have to go to our website to reserve a seat and pay a deposit. There’s only one sitting per evening with only 10 seats, sometimes 14, so a deposit is always required. 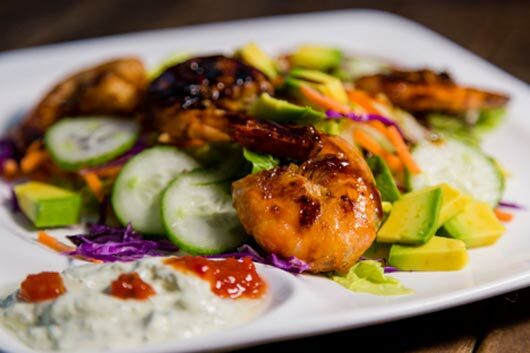 EJ: As a successful chef and someone who plays a very integral part in the tourism industry of the Turks and Caicos Islands, what do you think is missing from the dining scene currently? LK: Personally, I think there’s a “same-ness” that’s invaded the culinary scene. At most of the restaurants the menus are so similar and I think that sense of adventure is beginning to fade. This is why I appreciate Chef Nik for highlighting local Turks and Caicos food and letting them shine. I do that as well but I also go outside of the Turks and Caicos and give guests complete Caribbean exposure with the ingredients. I think most of the restaurants are not adventurous enough. I also love Kalooki’s and how they stick to their Jamaican roots. SUI-REN at The Shore Club is exploring Japanese and Peruvian influences and that’s exciting. We need more adventure and innovation in the industry. EJ: What’s the one ingredient you can’t cook without? LK: I love ginger in all its forms – candied, pickled, any form you can imagine. It’s a strange choice for favorite spice but I love it. EJ: What advice do you have for aspiring chefs in the Turks and Caicos Islands? LK: Go for it! I would also encourage them to not think of being a chef as it is typically thought of – get into a restaurant, work in a brigade, get up the ladder and become a sous or executive chef in a particular time frame and then push to have your own restaurant. Rather, think outside of the box. I have personally never worked in a restaurant brigade and I’ve never been interested in working in a restaurant setting because I have an adventurous spirit. It was never attractive to me to go that route. I think that they need to see being a chef as more than just being in a restaurant and slaving away but to realize that they need to know their worth. Unfortunately in the industry in the Turks and Caicos chefs are not paid enough. That’s something that concerns me so I think the profession might not be attractive to young people. Young people, if it’s your passion, go for it! And strive to be more than a chef. For example, I’m a chef but I’m also a clinical herbalist and I explore all the facets of the hospitality and service industry. It makes you understand the totality of the industry and be more rounded. Expand yourself outside of the kitchen and that will help to feed your creativity, drive and passion. Otherwise, you’ll get bored, and you should never let that happen.